Without mixing religion with nationhood, the fact is the Yezidis, in general, consider themselves a separate ethnic group from the Kurds, and in Russia (and several former Soviet republics - i.e. Georgia, Armenia, Azerbaijan, Ukraine...) they are classified as a minority nation as well. They are kown as Yezidi or Yazidi (ئێزیدی or Êzidî in Kurdish, يزيدي or ايزدييزيدي in Arabic, ܓ̰ܠܟܝܐ in Assyrian/Syriac and Езиды in Russian). Yazidis make up an important Iraqi minority community. Estimates of the size of the Iraqi communities vary significantly, between 70,000 and 500,000. The Georgian community has declined significantly (decreasing from 30,000 during the 1990s to an estimated 14,000 in 2008), while communities in Armenia have been more stable (some 40,000 according to 2001 census). In Russia, the Yazidi population totals 31,273 (2002 census). In Syria, there are two main groupings, in the Jazira and the Kurd Daege, accounting for about 15,000 people. In Turkey, there are now just a very small remnant in some villages south-east of Diyarbakir, remnants of a community of some 80,000 in 1970 (declined to 23,000 in 1985 and to 377 people in 2007. The Yazidi number around 200,000 to 300,000 individuals in total, but estimates vary on their population size, partially due to the Yazidi tradition of secrecy when asked about one's religious beliefs. Lower estimates are around 100,000, and high estimates around 700,000. Expatriate Yazidi are concentrated in Germany, numbering between 20,000 and 40,000, mainly in Lower Saxony and North Rhine-Westphalia, most of them from Turkey. A much smaller diaspora community is found in the Netherlands. Very small groups are also found in Belgium, Denmark, Sweden, France, Switzerland, the United Kingdom, the US, Canada and Australia, probably totaling to below 5,000 people. The flag of Yezidis (at least in Russia and Caucasus region) is a yellow sun charged in the middle of the red and white, vertical bi-color. The standard (or banner) is white with the primary symbol of the Yezidis, TawÃ»sÃª Melek, the peacock angel. Jaume Ollé reported another flag, that of Iraqi Yezidis, in 2001 Flag Bulletin: green-red-yellow horizontal tri-band. New uniforms of the Ezidi force: «Defense Unit of Shingal» [HPS]. 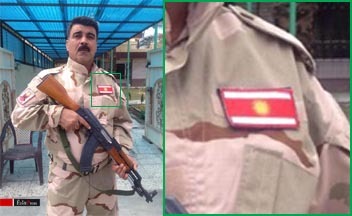 Resistance flag and coat of arms of the Ezidi combat unit"